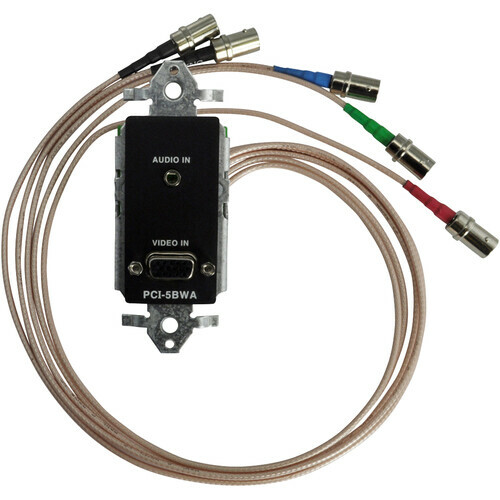 The FSR PCI-5SF is an interface converter for computer generated video; it accepts video from a computer source on an HD-15 connector and interfaces to a 5 BNC output for RGBHV connectivity. The audio interfaces from unbalanced stereo mini to balanced stereo audio. Converts an HD-15 connection with a VGA type signal to break out in five BNC connectors, therefore outputting RGB, RGBS and RGBHV. A bandwidth of 500 MHz allows for the passage of high resolution signals such as XGA. This Smart Fit unit mounts in a floor with the same dimensions as a power outlet; it allows for decorative connectivity without cables running across carpets or in walkways.